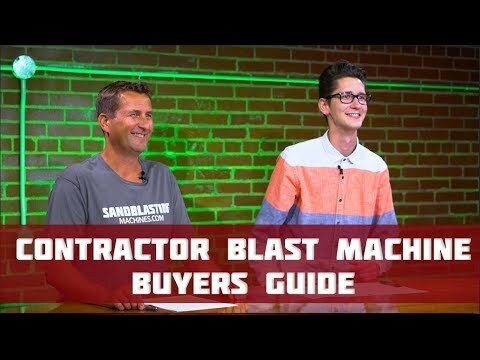 Clemco’s Contractor series blast machines are designed to be convenient, efficient, and durable for extended use in the field. Aside from the pressure-vessel, everything about these sandblasting machines looks different from their classic model counterparts. These differences were all developed to provide optimum operating safety and efficiency to contractors. All Contractor blast machines come mounted on an ergonomic cart made from heavy-duty steel tubing. This cart allows the machine to be moved with ease—both around the blast site and onto or off your pickup or trailer. Two cuft models have a 2-wheel cart while the 4- and 6-cuft models have four wheels. The cart’s sturdy handles form a cage that protects the components of the machine most likely to be damaged during transport: remote control valves, piping, and CPF breathing air filter. With a width of 29 inches, Clemco’s Contractor sandblast machines conveniently fit through standard doorways. Hookup points for blast hose and remote controls are centrally mounted on the front leg for convenience. A space on the leg is also provided for a breathing air line for efficient connections so you can spend more time blasting. Within the front leg is also a weather-tight storage area that can hold manuals, operating instructions, maintenance schedule, as well as small replacement parts. When service is needed, the Millennium inlet/outlet remote control valve can be field serviced with standard tools. We offer Contractor sandblast machines available in high-pressure and low-pressure packages, which include all machine-related parts and accessories needed to operate the machine, as well as Apollo Respirators. If you were looking for Clemco Classic Blast Machines, click here.